I’ve previously shown how in DNN you could recover your DNN host password. In present times DNN has shifted it’s default password policy in DNN 7.1.0 to use a hash password. What this means is that you can no longer simply see what the current password is for any of your users. While this is great for security it’s a problem if you’ve forgotten your password and smtp is down. See top 25 super users. Create a new super user. Now just save this file to the root of your DNN application (beside the default.aspx) and happy resetting. The most expensive bottleneck in your application is asking for data from your SQL database. The fact of the matter is that it doesn’t matter is it doesn’t how many rows of data you request, the sheer request itself is costly. The function below illustrates how easy it is to cache an object in DotNetNuke. It’s as simple as calling a standard function; checking in the cache if the value already exists; if not go get the data and then add it to the cache; return the cached object. Any time you are sorting or filtering the same collection of data multiple times. When the amount of data exceeds the amount of memory on your server. Data is only going to be access by one person every few days. The point is that almost all data should be cached in some shape or form. If your application contains a forum with millions of entries then you obviously can’t cache them all. But perhaps then consider only caching the top 100 posts that 90% of your users are going to see every time they hit the homepage of your forum. When adding or updating a row in your database. Make your SQL provider call as normal but have your business logic layer update that object into your cache as well. This will eliminate the need to make another return trip back to the database to get the same data. In my next blog I’ll discuss the benefits of client side caching. I had a blast during the voting process with Clint, Richard, Gifford, Ralph and all the others who entered the contest. I was really nervous that Clint was going to beat me so I enlisted everyone I knew to check out DotNetNuke and vote for me every chance they got. Even then I was still worried! By the time we got to DNN World I was just excited about all the cool things that we did with this contest and the friendships I made. I’m just glad DNN cake was pre-contest or I would have lost for sure! During my visit to DNN’s HQ in San Mateo I got to sit down and really talk tech and the future of DotNetNuke. Chief Marketing Officer Mitch Bishop’s vision on showcasing what DNN has to offer to everyone in the community is amazing and I can’t wait to see all those ideas come into reality. Joe Brinkman was even on hand to sit down w/ me and talk about what the cloud has to offer for DotNetNuke and ways myself and everyone can get the most out of it. What I found the most inviting is how passionate everyone who is working on DotNetNuke is, everyone from HR to sales down to the accounts who have a great spirit and joined into all the festivities. Including some DNNFoos which Will Strohl and I dominated Chris Hammond and Richard Dumas. I also got to see some of the other office tech equipment in the conference room where I video linked to Scott Willhite the Directory of Community Programs and Co-Founder of DotNetNuke. It was nice to get a real in depth look at the beginning of DNN . I hope DNN Corp plans on holding the DNN Superfan again next year at the DNN World conference and I would love the opportunity to pass the crown to the next Super Fan. The new human friendly is great but still requires that the user append the .aspx to the end of the page names. With IIS7 and Url Rewriting you can now add some lines to your web.config file and handle urls without the .ASPX extension. Below is an example of such a rewrite rule and you will place this inside of your node. This code works by first making sure that a file or directory with the /promo does not already exist. If it does then the physical file will take precedence over the rewrite rule. Second it will then take the domain url and append the .aspx to the end if it does not exist. So when you type in /promo behind the scenes it is serving up the page /promo.aspx. This is done without redirecting or changing the url. Now all your URLs in DotNetNuke can be simple and even more pretty. Update 1/25/2012: Here is an alternative version if you want to do 301 redirects to the page name vs rewriting the url. Many times users will only have the portal admin account and not the host account which contains the highest level of permissions and allows for installing modules and overall portal maintenance. One of the most common issues website owners have is they outsource the setup and maintenance of their website then for one reason or another they need to bring in another developer and the first thing that developer will ask is: “What is your HOST password?”. If you don’t have the answer to that question don’t worry there are a few ways to recover this password. The long way is to find a user whos password you do know replace the encrypted password and salt key of the host user with the user you do know. That works fine and is useful and all but requires a firm understanding of using SQL and the inner workings of DNN. But there is a better way. Forgot Password system will not work. DotNetNuke for security reasons will not return a password in the forgot password system when sending emails to the host user accounts. I have FTP access to my website. If you have FTP access to your website you can recover your host password with a little bit of coding. Follow the steps below and we’ll create a webpage that will return your host password. view raw file1.cs This Gist brought to you by GitHub. Now upload the file to the root of your DotNetNuke installation and visit the page. Copy the password and REMEMBER to delete this page IMMEDIETELY so you don’t forget and your host password is exposed. Slight variations to this script can be made if the developer removed the default host user account or you simply want to retrieve the password for another user. This will be a quick post. If anyone is like me and using the 4.1 version of the core DotNetNuke blog module than you’ve probably noticed that the “Written by:” is blank when viewing an individual blog entry. But if you you don’t want to do that. You can use a little jQuery magic like I originally did to fix the problem until an official update is released. This guide is for those who have a dedicated server and need to backup your DotNetNuke websites on a regular basis to prevent a disaster. There is plenty of software out there that will take care of backing up your website but the problem is it is either A. Too expensive or B. Doesn’t backup everything you need. This script was primarily written for SQL Express in order to give you a scheduled backup that Full SQL has but is just as viable to use with the full version of SQL. The result of this script will leave you with a directory of .BAK files of every database in your installation with a date stamp. --Add a list of all databases you don't want to backup to this. Removes any file in this directory that is longer than 14 days. sqlcmd -S . -i "E:\SQL Data\Scripts\Backup_All_Databases.sql"
forfiles /p "E:\SQL Data\Backup" /s /m *.bak /c "CMD /c C:\Progra~1\7-zip\7z.exe a -tzip -mx=10 @PATH.zip @PATH"
forfiles /p "E:\SQL Data\Backup" /s /m *.bak /c "CMD /C del /Q @FILE"
FORFILES /p "E:\SQL Data\Backup" /s /m *. * /d -14 /c "CMD /C del /Q @FILE"
All that’s left now is to create a Scheduled Task to run the above batch file every night and you have SQL backups! Removes any file in any of the sub directories that is older than 14 days. for /f %%a IN ('dir C:\webs\ /b /ad') do C:\Progra~1\7-zip\7z.exe a -tzip -mx=10 "C:\Backups\%%a\%%a_%mydate%.zip" "C:\webs\%%a"
forfiles /p "C:\Backups" /s /m *. * /d -14 /c "CMD /C del /Q @FILE"
Like before just create a scheduled task to run this batch file every night and you will have a 14 day backup of your website. 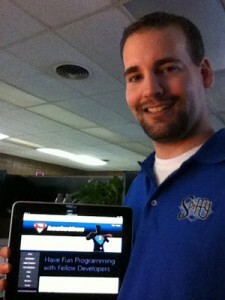 I was awarded the grand prize for creating the a charting DotNetNuke module for the Hackathon. The objective was to use visual elements such as jQuery to create a UI friendly application in 4 days.